At the Board of Supervisors December 17 Transportation Committee meeting Tom Biesiadny, Fairfax Co Dept. of Transportation director, presented the final list of projects to be built with new VA transportation funds. There are 112 Pedestrian and Bicycle projects totaling around $145 million. Another $50 million is proposed for ped/bike access to the Silver Line Phase II stations and $10 million for "Additional Countywide Dialogue on Transportation Requests." See the presentation on the unfunded projects. See the original lists of all of the proposed projects. Most of the Pedestrian and Bicycle projects are sidewalks ("Walkways"). While some bicyclists will use sidewalks, especially kids riding to school, very few of those projects include bicycle facilities. We've identified 18 projects that are either primarily bike facilities, or include a major component that will benefit cyclists ($43.31 million over 6 years). I'm sure there are more but without knowing the width of the "Walkway" projects, it's difficult to know whether they would also serve cyclists. Below shows the distribution of funds across the various project categories. Ped/Bike projects would receive 16% of the total. We've estimated that bike-only projects would receive approximately 3.5%. Many of the road projects will include bicycle facilities. FABB advocated for setting aside funds for projects included in the Bicycle Master Plan, which has not yet been adopted by the Board. The $10 million identified for additional dialogue requests could serve that purpose. The Board will now evaluate the list and provide feedback to staff by January 14. A final list will be presented to the Board on January 28 when the Board will hold the public hearing on these projects and make a final decision. If there is a bike project that you think should be on the list, contact your Supervisor to ask that it be added. The Sunday Post has a good article on bicycle theft in the region, Bike thefts rise in D.C. and Northern Virginia, with Metro stations frequently targeted. See our blog post in September about increased thefts in Fairfax. In Arlington County, 380 bike thefts were reported as of mid-October, compared with 233 during the same period a year ago. Fairfax police reported 468 thefts in that period — up 19 percent from 2012. In Alexandria, bike thefts are at a five-year peak. As of late September, 153 had been stolen this year, up 43 percent from last year. D.C. police reported arresting 98 people for bike thefts in 2012, up from 65 arrests the year before. The rise in thefts might be partly a result of the District’s success in promoting bicycle use. The percentage of people biking to work in the city increased more than 30 percent from 2011 to 2012, based on data from the U.S. Census, adding tens of thousands more bicyclists to the road. Metro stations are a frequent target. They have seen a 50 percent increase in bike thefts over the past year, from 202 reports last year to 303 as of the end of August this year, said Morgan Dye, a spokeswoman for the Washington Metropolitan Area Transit Authority. This evening, 25 people turned out for the first EVER Reston Tour De Lights, organized by Dan Kole of the RA PBAC. The tour went from Lake Anne Plaza over to Reston Town Center, where we stopped for a photo opp at the big tree. From there we hopped on the W&OD, then worked our way back up via Old Reston Ave to head north. Working our way through neighborhoods around North Point, our ride's high point was the "St. Jude's house". Of the riders, 5 were kids. Two of those were in a trailer, 2 on a tagalong (poor Steve Gurney). One rode independently the whole way without complaining. (My neighbor's 7 year old). The weather undoubtedly helped the outcome. We had one rider, Gwen, who came from Falls Church, and (FABB volunteer) Jenifer Madden came from Vienna. Three sisters joined us -- two of them having traveled from North Dakota for the holidays! They all hauled out dusty bikes, pumped up the tires, and had a great time. Approximately 25 people attended a meeting to discuss the feasibility of starting a bike share system in Reston. Fairfax County received funds to conduct a feasibility study and recently awarded a contract to Alta Planning + Design. The county also received $400,000 from MWCOG that can be used as startup funds for implementing a system. Supervisor Hudgins kicked off the meeting by discussing the importance of biking as a transportation option in Reston, and that Reston is an ideal community for bike sharing with our system of paths that connect the village center and future Metro stations. Representatives from the business community, VDOT, Fairfax County, Reston Pedestrian and Bicycling Committee, Northern Virginia Regional Park Authority, Reston Association, Reston Town Center Association, FABB, and others attended. Alta reps and Chris Eatough of BikeArlington gave an overview of bike sharing in general, and they discussed the Capital Bikeshare system (CaBi) which is operated by Alta Bikeshare, one of Alta Planning's partners. CaBi is currently located in DC, Arlington, Alexandria, and Montgomery County. Bike sharing can be a great supplement to an existing transit system. It allows visitors and residents to get around Reston without the need to drive for short trips. Someone working in Reston Town Center would be able to take Metro to the Wiehle-Reston East station, check out a bike, ride to the Town Center, then dock the bike and not worry about parking or security. Short trips under 30 minutes are "free" by being included in the annual membership cost of $75. Monthly, Daily, 3-day, and Daily Key options are also available. An extensive support infrastructure is needed to operate a successful bike sharing system. Bikes need to be maintained on a regular basis. Since some stations are more popular than others, the balance of bikes at various stations needs to be adjusted according to use. Alta Bikeshare uses a warehouse for maintenance and storage and they use several vehicles for rebalancing. Since Reston is not physically close to the rest of the system, there would be a need for a remote maintenance facility and rebalancing vehicle, similar to what is used in Rockville, which has 16 stations and is also not contiguous to the existing system. The group discussed various challenges to implementing a system in Reston including the need for better bicycle infrastructure, finding sponsors to supplement county funds, variable terrain, and residents who don't often think of taking short trips by bike. The group also discussed possible locations for future stations including the new Silver Line stations, Reston Town Center, Village Centers, major employers, Plaza America, International Center, high density residential complexes, and park and ride lots. 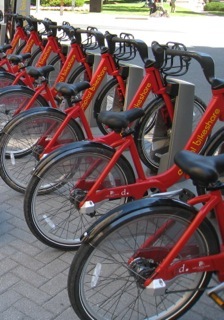 A community meeting on the feasibility of bike sharing in Reston is planned in January. Thanks to Pete Beers for organizing the first FABB/WABA Suburban Holiday Shopping Ride. Pete met the group of riders (there were 11 who joined at some point) in Vienna, cycled to Tysons where they shopped for a couple of hours. They then rode to the Mosaic District for more shopping, then back to Vienna. In the photo on the right, note the shopper bike racks installed at the Mall. Not many people know they are there since most people think you're crazy to ride in Tysons. Pete showed the group that it is possible to ride there safely and avoid the hassles of driving and parking. The best response that I got when I proposed this ride was "Ho Ho NO. I'll follow you to Certain Death, Pete, but not to Tyson's Corner (a fate worse than . . . )." Happiness machines: The many benefits of bikes include slowing the aging of skin, getting you to sleep promptly and separating you from air pollutioncompared to car use. Bike share placemaking: In NYC, Citi Bike stations are providing more than just transportation. People are using them for on-street public seating, rendezvous points and interaction hubs, all from "the space that would have otherwise been used to store a couple of empty cars." Total safety: The almost daily drumbeat of road deaths has convinced a TV anchor in New York City that Vision Zero, a policy that to use road design to eliminate them, is "a fight worth having." Suburban calm: The "safest suburb in the world" got that way by building "two separate transportation networks." The city of 44,000 suffered exactly one traffic fatality between 2001 and 2005. Gas tax hike: U.S. Rep. Earl Blumenauer (D-Portland) wants to add 15 cents per gallon to repair roads and build new infrastructure. It'd be the first such increase in 20 years, during which time the market price of a gallon has risen $2.20. License requirements: A British driver's license is "basically a Ph.D. in driving," while American driving tests are "a joke," writes an American in England. Safety gap: People on bikes and foot account for 15% of annual average U.S. traffic deaths, a recent study found. In car-bike collisions, people were using bikes legally 89% of the time and people in cars are at fault 87% of the time. E-bike ban: NYC's government is in hot water over a new law banning the use of electric bikes by businesses or their employees. Street grid science: On Strongtowns.org, Andrew Price looks closely — very closely — at six different street grid patterns, including Portland's, and offersrevealing insights about the cities each one creates. Black Friday parking: "If you want to build a strong town, get rid of your parking minimums," writes Chuck Marohn in a photo essay ridiculing the amount of land devoted to auto parking that's useful on one day every year. "Any chaos that ensues will be healthier for your city than the acres of unproductive, wasted space we have justified with a veneer of professional expertise." Pro-bike smackdown: "Just as it would be inefficient to force travelers to walk or bike for trips most efficiently made by motorized modes, it is inefficient and unfair to force travelers to drive for trips most efficiently made by active modes," writes Todd Litman in a total demolition of most arguments in favor of car-dependent cities. I especially like his calculation that building Portland's 2030 bike plan would cost "$6 to $25 annually per capita, a small fraction of the approximately $665 per capita spent annually on roadways." 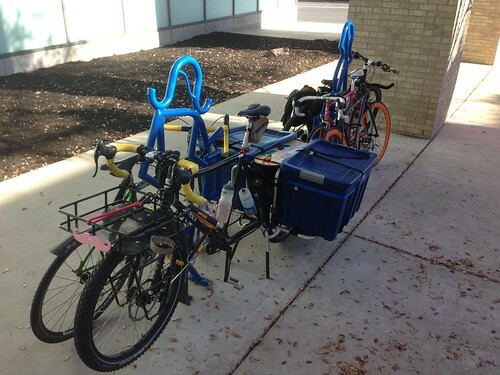 Cargo bikes: It's the Associated Press's turn to notice that these are a thing. Outrage shortage: Last week's awful New York train derailment that killed four, injured 60 and got wall-to-wall news coverage and investigative resources was dwarfed by the little-noticed death toll of local street systems. Indoor parking: Bike theft is a significant barrier to biking, and the infrastructure that fixes it is secure indoor parking, says newspaper coverage from Vancouver BC. Biking gadgets: Laser-projected bike lights, snap-on electric assists, airbag-style helmets: all part of a boom in cool bike gadgets, but maybe a "distraction" from the supposed need for "hard segregation" to improve safety. In June the Town of Vienna disbanded their Bicycle Advisory Committee. Vienna has made progress over the past several years in becoming a more bicycle-friendly community and we're glad they are reforming their BAC. If you live in the Town and are interested in serving on the committee, see below for info on how to apply or contact us if you have questions. The Vienna Town Council is seeking Vienna citizens to volunteer to serve on the re-established Vienna Bicycle Advisory Committee and the newly created Pedestrian Advisory Committee. The Committees will serve as advisory boards to the Transportation Safety Commission (TSC) and members will be appointed by the Town Council. Each Committee will consist of six community members, in addition to a member of the TSC to serve as Chair. The Committees will meet on alternate months at 7 pm prior to the Transportation Safety Commission meeting on the last Tuesday of each month at Town Hall. The goal of the Committees is to provide recommendations to the Transportation Safety Commission and the Vienna Town Council for improving the pedestrian and bicycle network in Vienna. The Vienna Town Council will consider applicants for appointment in December and January, with the expectation that the Committees will begin work in January. Anyone interested in serving on the Bicycle Advisory or Pedestrian Advisory Committees should complete the Board and Commission application available online or in the Town Clerk’s Office in Town Hall, 127 Center Street S, 2nd floor. For questions on the application process, contact the Town Clerk’s Office at (703) 255-6304. "My wonderful, safe, climate-controlled, comfortable cocoon." Earlier this month I wrote a letter to the Post in response to an article about the lack of auto parking at the new Tysons Silver Line stations. I noted there is bike parking at each station, and that many people could bike there. The Post article mentioned John Lucas who lives near Tysons but prefers to drive, stating that "There are not alternate forms of transportation that are reliable." I mentioned in my letter that Mr. Lucas could bike to the nearest station and get some exercise in a pollution free manner. Apparently Mr. Lucas does ride a bike but he also seems to love to drive as evidenced by the final sentence of his letter to the editor that appeared in today's Post: "I’ll give up my steering wheel when you pry it from my cold, dead hands." So much for using an alternate form of transportation. In a Dec. 2 letter, Bruce Wright, the chairman of the Fairfax Advocates for Better Bicycling, suggested that I should walk or bike a mile to the new Tysons Silver Line Metrorail stations, instead of driving, and thereby get some exercise, ease congestion and reduce pollution. Mr. Wright’s suggestion was a perfect example of why the parking dilemma facing soon-to-be Silver Line commuters should have been resolved long ago. Fairfax County’s failure to accommodate those commuting to Tysons Corner by automobile will be a colossal failure, especially when winter’s worst arrives. Mr. Wright’s appeal to commuter ruggedness is wishful thinking. Though I manage, as an 80-year-old, to bike 25 to 30 miles per week, I would be ill-advised to risk traveling down busy Leesburg Pike to Tysons in anything less than my wonderful, safe, climate-controlled, comfortable cocoon — just like other automobile commuters are inclined to do. While much of the rest of the globe races to embrace individual carbon-powered transport, we race to handicap our economy through forced carbon energy denial. The atmosphere we seek to protect is the same one being polluted by the rest of the world, which will gladly consume any energy we eschew. Our ability to drive anywhere is a blessing that most fail to appreciate, especially those coercive utopians who seek to remold our society into something it will never be. While driving, it should always be comforting for me to recall, and edit slightly, the late Charlton Heston’s proclamation: I’ll give up my steering wheel when you pry it from my cold, dead hands. Mr. Lucas does have a point. Cycling into Tysons from the west along Route 7 is dangerous. A trail on the south side of Route 7 ends before the bridge over the Toll Road and there are no on-road bike facilities on a road that has high speed traffic and several entrance/exit ramps to the Toll Road. There are plans for 10-foot asphalt trails on each side of Route 7 from Reston to just west of the Toll Road bridge. At the same time a new Toll Road bridge with bike and ped access is in the works. Both projects should receive funding from the new transportation money. The only safe option for most cyclists is to take a very circuitous route to the south that uses neighborhood streets, past Wolf Trap, to the Ashgrove Trail behind the Sheraton and new Walmart near the Spring Hill Metrorail station. That route ads about a mile to the trip, not a great distance for any cyclist but it's definitely not a convenient, direct route. There is a bus that travels on Route 7 and I was surprised to see that it only runs every hour. No wonder most people drive. Not only does the county have a very difficult marketing task ahead of them to convince dedicated motorists to try using alternative transportation modes, they need to create a safer biking and walking environment and provide better transit options. While progress is being made, there is a very long way to go before Tysons and the surrounding area is bike-friendly. I didn't discuss Mr. Lucas' comments about climate change. According to his line of reasoning, the world should race to burn as much carbon as possible before others do the same. Is it any wonder that so little progress is being made to slow the warming of the planet? I wonder what Mr. Lucas' grandchildren will think about his philosophy 20 years from now? Nor did I mention that over 33,000 people died in car crashes last year, an increase of over 1,000 from the previous year. Not my idea of wonderful and safe. Holiday shopping by bicycle? That's just crazy talk…. or is it? The folks at Fairfax Advocates for Better Bicycling in conjunction with Washington Area Bicyclist Association would like to invite you for a seasonal shopping ride to show you how easy it can be. 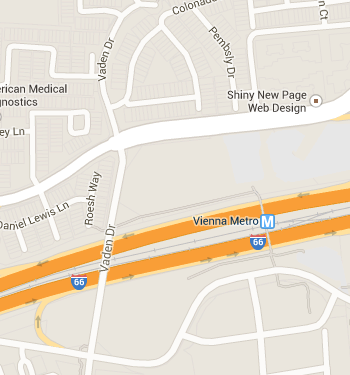 We'll start at the Vienna Train Station on the W&OD Trail and ride to Tyson's Corner for 2 hours of shopping. This is a great place to get lunch while you're there! From there we'll head south to the Mosaic District for another hour of gift shopping in their wonderful stores. After that we'll load up and ride back to Vienna Station. 12.5 miles in all. "What if I purchase more than I can carry on my bike?" you ask? NO PROBLEM! Pete will be riding his cargo bike with cargo trailer attached to carry anything you've purchased that won't fit on your bike. You'll have experienced ride marshals to help guide the ride and someone at each stop that will help lock the bikes and keep an eye on them while you're shopping. To make it more fun, Tyson's Corner Shopping Center and the Freshbikes shop in Mosaic District have chipped in VIP Shopping and Dining discounts and a shopping/gift bag for each rider. Distance: The ride is 13 miles in all and will include some Multi-Use trail as well as public roads. What to bring: A helmet is required for this ride! You'll need a bike, a bike lock and clothes/shoes that are suitable for riding and shopping. Please have a mobile phone so that you can be contacted to regroup to continue the ride. All riders will be asked to sign the ride waiver. Many thanks to the Tyson's Corner Center and Freshbikes for making this ride possible! And thanks to Pete Beers for organizing the ride. Please RSVP to Pete at Pete.Beers@gmail.com or on the Facebook Invitation. Not long ago we received the following message from a cyclist regarding detection of bicycles at two intersections adjacent to the Vienna Metro station. We sent the query on to VDOT and received a very thorough and informative response that we thought worth publishing. Many of us have had problems with traffic signals not changing because our bicycle was not detected by in-ground sensors. The following information explains some of the intricacies of vehicle detection at signalized intersections. Thanks to Randy Dittberner for taking the time to respond. 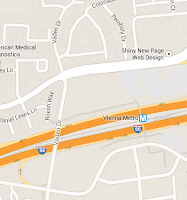 This fall I've been commuting on a route that takes me along Vaden Dr., past the Vienna Metro. I've noticed that the stoplights at Country Creek Rd/Virginia Center Blvd and Sainstbury Dr. seem to take forever to change if I'm there alone, but not if cars are with me, making me suspect that they are activated by inductive loop sensors. I wonder if you know anything about this and if anyone is pressing the county to mark the sensors (see FHWA link). 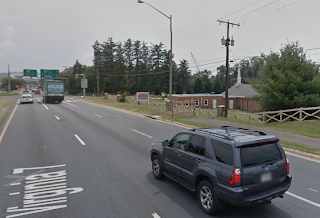 As you may know, the signal at Vaden and Saintsbury is new--so new that VDOT has not yet accepted it into our system. It is still being operated by the developer constructing the MetroWest project. Questions or comments about this signal can be directed to the VDOT permittee, Jeff Edelman (571-283-1978 /jeff.edelman@pultegroup.com), or agent Jeff Oetjen (703-801-5848 / joetjen@comcast.net). The signal at Virginia Center has been in place for many years and is operated by VDOT. This signal is actuated using inductive loop detectors, the most common detection technology VDOT uses at its signals. In general, VDOT uses the same loop detector design at all traffic signals: a rectangle 40 feet long (parallel to the direction of traffic) and 6 feet wide. The edge of the detector typically extends past the stop bar by 5 feet, which leaves 35 feet of detection zone approaching the stop bar. A detector is typically centered in each traffic lane on the side street. This link shows a typical VDOT loop detector installation, but usually loops are installed before the final pavement surface and are hence invisible. VDOT normally uses a detector called a “quadrupole” loop, which has its greatest sensitivity along the centerline of the loop (parallel to traffic). Cyclists have the best chance of being detected when they ride in the exact center of the traffic lane at some point while they’re within 35 feet of the stop bar. Caveats: Sometimes loops are shortened or lengthened based on site conditions, and it can be difficult to find the center of a loop on a sharp curve, because loops are always rectangular even when the road is curved. Some intersections use a different kind of detection other than loops for various reasons, and the advice about loops may not apply at these locations. If all else fails, this signal is also equipped with pedestrian pushbuttons on both sides of Vaden. 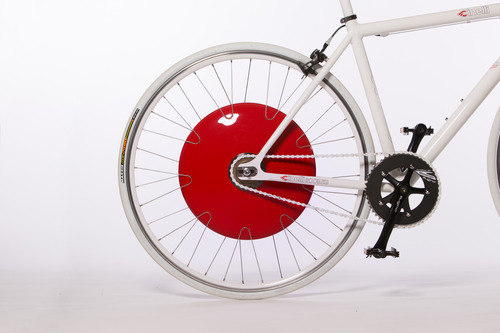 While it can be an annoyance for cyclists to use the pushbutton, at least the option is available in this case. By coincidence, I cycle through the Virginia Center intersection frequently, and I have found that it is remarkably effective at detecting cyclists. I have not found the same to be true at the Saintsbury intersection. No loop detector can detect every bicycle, particularly those without a considerable amount of metal in the frame. VDOT is undertaking a pilot project to improve detection of cyclists at signals, and the Virginia Center intersection is planned for inclusion in the project because of its above-average ability to detect cyclists. The project may include some bike detector signs and pavement markings, but specific details are still under development. You may also recall that VDOT worked closely with Dave Gibson, the FHWA researcher who authored the document at the link Mr. Schrag sent, when we installed the loop detectors and associated markings in the bike lanes on Soapstone Dr. at South Lakes Dr.
We noticed this article in the online Post: New Md. State Police video encourages enforcement of driver-cyclist laws. The title of the 33-minute video is The Law Enforcement Role in Bicycle Safety. The video will be used as a police training aide "to enhance the safety of bicyclists and other road users, to help officers identify and enforce illegal behaviors most likely to cause traffic crashes between bicyclists and motorists, and to assist officers in the investigation and reporting of crashes involving bicyclists." It looks like a good resource for Maryland police. FABB is working with Fairfax County police on producing a similar video for Fairfax. The video contains seven sections with a test at the end. Why is this a job for law enforcement? Compiled from federal and state databases, the report by the U.S. Public Interest Research Group gives a snapshot of a transportation evolution that may portend where the nation — particularly urban America — is headed. It is the latest of several recent white papers that cite waning use of the automobile to argue for changes in public policy away from the highway-oriented focus born during the suburban expansion of the 20th century. Many of the policy changes the report recommended are already in place in Washington and some of its suburbs. Encouragement of the popular Capital BikeShare program and installation of bike lanes have correlated with a spurt in bike travel. We've added the emphasis on the text above. That message is very timely as Fairfax County determines how to spend new transportation funds. Among the options being considered are very expensive road widening and interchange projects vs. transit, bicycle, and pedestrian projects. Even the transit projects focus primarily on parking facilities for cars. Young Americans Lead Trend to Less Driving, New York Times. We're Buying Fewer Cars, Driving Fewer Miles—and Buying Less Gas, Pacific Standard. Phoenix Bikes and the Arlington County Department of Parks and Recreation will co-host a second public meeting tonight to discuss various options for a new education center for Phoenix Bikes and public restrooms along the W&OD trail and Walter Reed Drive. This meeting will give you background on Phoenix Bikes and its work to empower youths as well as information on developing a new facility. The meeting is Wednesday, December 4 from 7-8:30 p.m. at the Park Operations Building Conference Center, 2700 S. Taylor Street. Included on the page is a way to request a membership package that will include a membership application form and a membership agreement and other info. The membership cost to use this facility is $75 a year, which includes a one-time $15 non-refundable fee for the security device and application processing. After the first year, users will be charged only $60 a year. 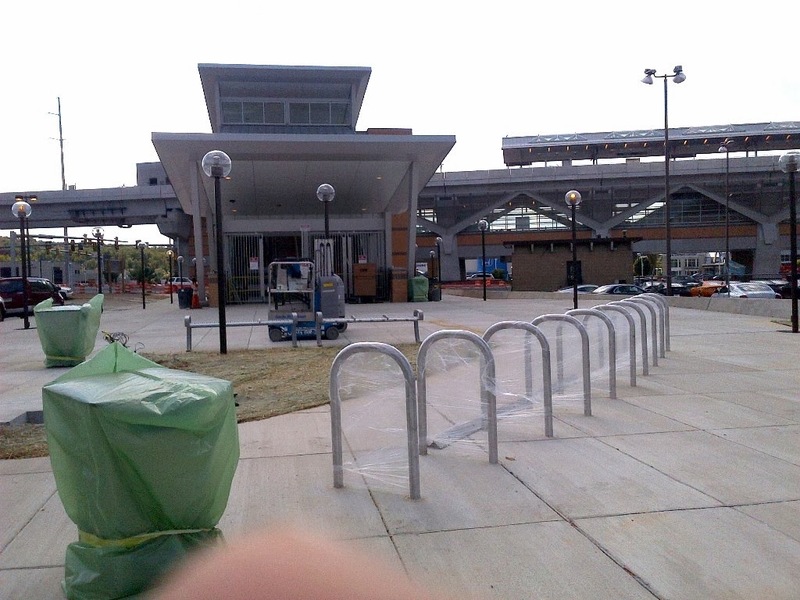 The room will be available to bicyclists starting on opening day of the Silver Line! That's the online title of our Letter to the Editor that appeared in today's Post. It was based on the print article Parking worries loom over Silver Line (of course the Post uses a different title for the online article). There is a common misconception that there is no parking at the Tysons Metrorail stations. While it is probably not sufficient, there is bike parking at each of the four Tysons stations, and biking to the station from surrounding neighborhoods is very feasible and will get better once planned bike facilities are built. In “Parking worries loom over Silver Line’ [front page, Nov. 28], those who live near the Tysons Silver Line Metrorail stations bemoaned the lack of parking at the stations. While there is no car parking planned, there will be bike parking at each of the stations. Sally Horn of the McLean Citizens Association said “many members of her group live just far enough away that driving to a station is their best option.” For some of those residents, bicycling to the station is one of the better options. For John Lucas, who lives about a mile from the station, driving his car, parking and walking to the station entrance would probably take him longer than taking the same trip by bike. And if he biked, he would get some exercise, burn no fossil fuels, generate no pollution (short car trips generate more pollution than longer trips) and avoid adding to the already-congested Tysons streets. Bicycling is one of the best first- and last-mile solutions. It’s not for everyone, but those who are willing to try might find it’s easier than they think. The writer is chairman of the Fairfax Advocates for Better Bicycling. Fairfax County has also made extensive changes to transit around the stations that will facilitate taking short trips to Metro. In order to entice residents, who know of no other way to get around than to drive, to take transit, it need to have frequent service and be convenient. Even if that is the case it will take a major change in mindset for many Fairfax County residents to try transit or biking. It's delusional to think that if there are be massive parking garages at each of the stations there would not be more congestion in Tysons. Driving alone for short trips just does not make sense; it's wasteful, expensive, and does not contribute to creating livable spaces. Recently, the Washington Area Bicyclist Association partnered with Collective Action for Safe Spaces (CASS) in the District to give cyclists a safe place to vent and discuss harassment prevention and empowerment strategies, said Nelle Pierson, WABA’s coordinator of outreach programs. “A lot of women start biking because it is empowering, but also because they can just get away from a situation,” said Zosia Sztykowski, 28, of Columbia Heights, the lead outreach coordinator for CASS, a grassroots organization dedicated to building awareness and ending sexual assault and harassment on the streets. The organization produces a blog that curates women’s experiences with street harassment. “A lot of people think street harassment happens just to them and that they’re alone,” she said. Bystanders can help by confronting or distracting the perpetrator or seeking help from law enforcement on the victim’s behalf. Often, bystanders avoid getting involved because they worry that they have misread the situation, think someone else will step in to help or believe that the target attracted the negative attention due to some fault of his or her own, according to Strange.